THE PROBLEM: Design a futuristic product that decreases Mason homeowners utility consumption through elegant display of real-time data. People can’t physically see the damage that is being done to our environment and are unaware of how much water and electricity they consume. With growing technology, accessibility to personal data on water and electrical usage is becoming more available, however, options of how to view this information in personal spaces is scarce. We want to help our users become more aware of their usage within their household and show how their utility usage impacts the environment through elegant display of real-time data that summarizes breakdowns of water and electricity consumption throughout their home. This will be done through an interactive ecosystems that act as art pieces projected on virtual screens throughout the home. People will be able to interact with these art pieces, while learning about their own habits and how to better themselves at the same time. We will be creating a virtual experience, which allows users to directly observe their water and electric usage from a touch-based OLED system. From tracking gallons of water used and wattage of energy used, people are able to see cost-savings accrued based on time, from months to years. This system will also offer future projections of cost savings based on current usage habits. The main key feature of this system is the aspect of an interactive environmental space, where people will see their behaviors and habits directly affect their own personal ecosystem. This procedurally generated ecosystem will act as a virtual window display that people experience throughout their home. Behaviors will directly correlate with the visual content that is being shown on the interface. For example, with more sustainable water usage, the digital environment will become more lush and growth will increase. Whereas with overindulgence, the environment would become more dry and less dynamic. Regardless of use habits, we imagine this system will always present beautiful images, never discouraging the user to turn off the experience and disengage with the product. To further enhance motivation for the user, we want to include factual information on actual elements of the ecosystem that the user chooses. People can toggle between a variety of different ecosystems according to household aesthetic preference. This way, the user will be saving water and energy, growing more aware of their consumption and seeing their aesthetic needs fulfilled, all at the same time. For our research, we did a survey and in-person interviews to understand more about people’s utility consumptions. For example, users were asked whether their utility habits were affected by other people and how much water and/or electricity are consumed in their household. From our surveys and interviews, we have found that 63.2% of the respondent stated that their utility bills do not affect their usage habits; however, 74.7% are willing to limit their usage. The utility bills does not state the how overusing water and/or electricity impacts the environment. From this finding, we want to motivate homeowners to change their habits through visualization of environmental impact by developing a product that analyses and keeps track of their consumption to improve their habits with real-time feedback. Our target demographic is Mason home buyers and renters whom are looking for prefabricated living experiences with elevated technology. They want to make the world a better place through their own behaviors and habits within their living spaces. They want to experience personal digital interactions that are unique to their households, while being able to compare with environments in areas around the world. Through our conducted user testing we were able to refine our product from a UI perspective. Our conducted user testing brought forth many learning opportunities for refinement. Users often were confused by icons and occasionally did not like the verbiage used. From there we were able to make changes. Through our testing we were also able to learn of two major pain points how the user interacted with the product and where the product would be interacted with in the home. These two pain points became instrumental in the ongoing process that followed. Initially we had decided upon implementing a gestural and voice activated system that would track the user’s movement throughout the home. However, during the user testing it was brought to our attention by a few participants that people tend to dislike being constantly monitored in their home, both visually and audibly referencing to Amazon’s Alexa. We also learned that the gestural system was not intuitive enough for the users. Many of the participants assumed it was a touch based system and immediately went to tap the screen when presented with the product. Even when we explained the gestures to the participants they were still confused and uncomfortable with the motions they had to perform in order to use the product. When we asked for suggestions each participant had a different gesture that suited them. This diversity of assumed gestures brought us to the realization that gestures were not going to be the why we wanted people to interact with our product. Our second pain point, location, ties in to our decision to switch to touch based as well. If the system was gestural based and a ecosystem screen was above the couch in a living room it would be awkward and clunky for the user to interact with. Taking what we had learned from how the user is to interact with the display we now had to decide where this interaction would occur. 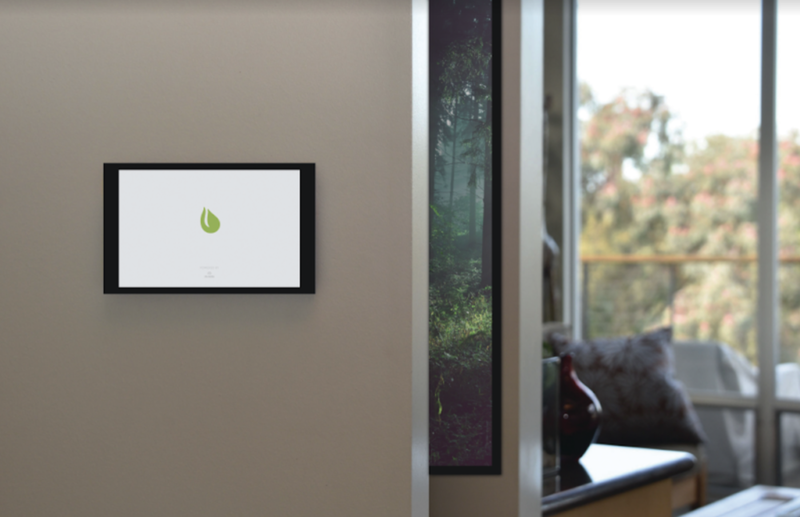 As we thought of different scenarios we thought it best to create a central system display that would act as a control panel for all of the ecosystem screens throughout the home. This central console would be placed in a discreet location in the home, assumedly next to the thermostat. At this central console the user would be able to see all the information that is collected and visualized in the displays around their home. This idea worked well with many of our participants. This separation of ecosystem displays and hard data also allowed the ecosystem displays to successfully act as ambient pieces of art that visually communicated the utility usage throughout the home.